Big, succulent Maine lobsters are best boiled. 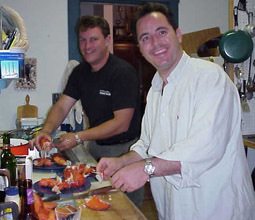 Chefs Andy and Young Bruce prepare lobsters so they are easy to eat. Put lobsters one by one into boiling water. Wait for water to return to a boil. Cook 5 minutes for first pound, 3 minutes for each additional pound. Break off bodies and rinse. With a hammer and a cleaver, crack shells. Remove tail and claw meat. Serve on a big tray with melted butter and lemon juice on side. On Memorial Day Week End, May 30 1999, we all went to Maine. Young and Maddie left early Friday and beat the traffic. Eileen and Bruce went up on Saturday. That evening Andy, Gail and Ikaros arrived! 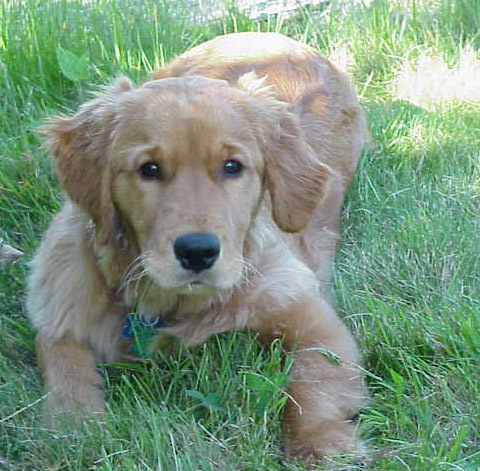 Ikaros, at that time, was an adorable Golden Retriever puppy who loved huge bone-shaped dog biscuits, melon skins, and people. 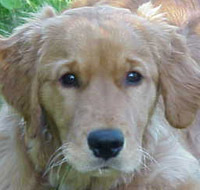 Ikaros was the friendliest pup you'll ever meet! We buy, prepare and eat lobsters in Rhode Island and in Maine. We prefer large lobsters, boiled, and pre-cracked. 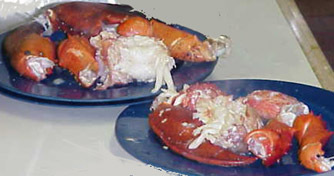 Boiling is the fastest way to prepare a lobster and it never tastes better. Leave all that stuffing and baking to restaurants. For perfect baked or grilled lobster, see Michael O'Brien's Baked Stuffed Lobster on Skewers.